Khloeé Kardashian's mom gave a good news this morning, Khole welcomed a baby girl with her boyfriend Tristan Thompson who was found cheating on her. The couple reunited for the sake of baby, Thompson is a Canadian professional basketball player for the Cleveland Cavaliers of the National Basketball Association. Kardashian and Jenners are happy for the newest addition in family. Her mom was the first one who confirmed that Khloé Kardashian has given birth to a baby girl. Grandmon, Kris Jenner posted a short video on Instagram and Twitter and wrote a sweet statement: "BLESSED!!!" Kris included a comment while reposting a clip of her daughter Kendall saying "baby" over and over again. She wrote, "When three of your sisters give birth in under a year. Congratulations to @KhloeKardashian on welcoming another girl to the KarJenner clan," the mag's caption reads. Kris Jenner has become grandmom for the ninth time which follows Mason Disick, Penelope Disick, North West, Reign Disick, Saint West, Dream Kardashian, Chicago West, and Stormi Webster. 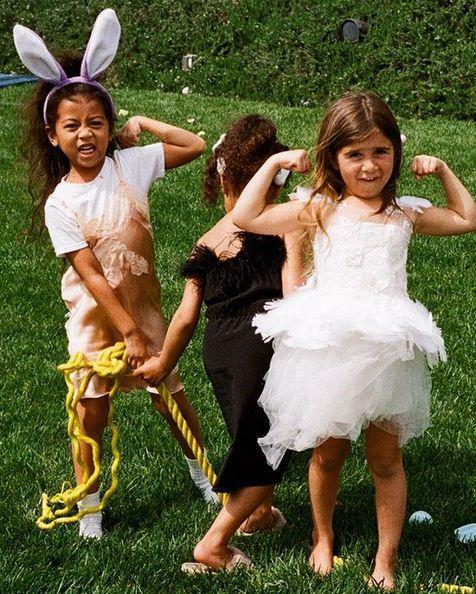 Khole's sister Kourtney Kardashian was the first one to post in Instagram after the baby's birth. Though, she didn't post anything related to the birth but she often promotes 'girl power' in the family pic which includes her daughter Penelope and niece North West. All the members of family are present with the couple which includes Kim Kardashian and Tristan Thompson.